Brie, along with Raphael Bob-Waksberg and Paul F. Tompkins, break down the creation of their (many) characters, from Vincent Adultman to "Andrew Garfield." Vincent Adultman isn’t the only voice Alison Brie handles on “BoJack Horseman.” He’s not even her primary role on the Neflix series (that would be Diane Nguyen). But the character who’s either one awkward looking man or three very coordinated children is so convincingly portrayed by Brie, she can’t shake him when creating new voices. On the show, BoJack repeatedly says the businessman who “went to the stock market today” and “did a business” is “very obviously three kids stacked on top of each other under a trench coat,” but every other character just sees an adult man named Vincent. (Get it?) 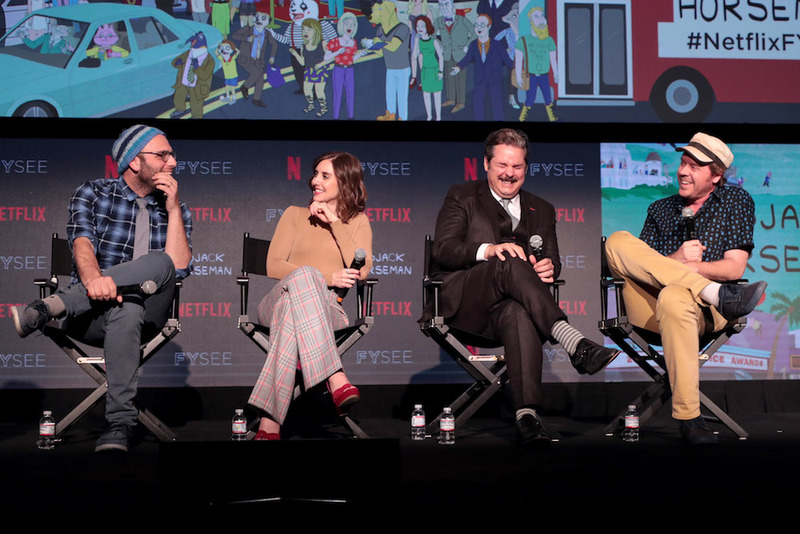 Creator Raphael Bob-Waksberg, who joined Brie, Paul F Tompkins, and supervising director Mike Hollingsworth on the panel, did not disclose the character’s “secret” identity, but he and Brie did discuss how she came to earn the role that sounds like a prepubescent boy. “Often, with both of you, there will be a new character and I’ll say, ‘OK, the main thing I need for this character is just to not sound like any other characters you’ve done before,” Bob-Waksberg said. But what Tompkins said he looks forward to most is when he’s subbing in for a well-known voice and has to approximate their voice as closely as possible; a comment that inevitably led to a fan-favorite pseudo-impersonation of one Andrew Garfield. Appearing in multiple episodes across Season 1, Tompkins voiced Garfield after the Oscar-nominated actor turned down the role. Needless to say, they could not, and Tompkins subbed in magnificently. As for Brie, she still wants to voice more characters and make a lasting mark — like with Vincent Adultman — even with the demands from her creator… and questionable support from her husband, Dave Franco.